It was only when I got a mail yesterday – thanks, James! – pointing out a League match I’d failed to include in the results archive from a few decades back that I was jolted into remembering a bit of annual housekeeping that I’d forgotten to attend to. 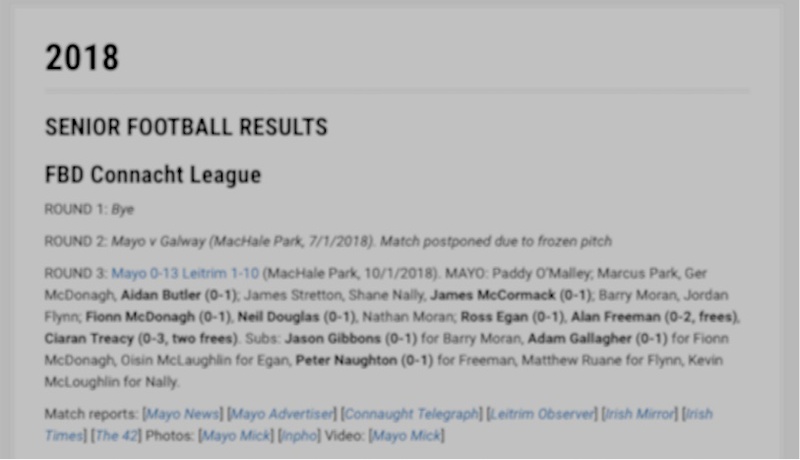 That missing League match – from 1981 – has since taken its rightful place in the archive (I’m always delighted to be told about such omissions, by the way, as it’s the only way in which a complete, accurate record of results will ever be gathered) and so too, for good measure, have the results of 2018. The current year won’t, for sure, go down as a vintage one. The highlight of the year was the run to the All-Ireland final at U20 level but there, as has happened so many times in the past for so many other Mayo teams, defeat awaited them. We never really got going at all at U17 level and, I suppose, the less said about our year at senior level the better. Outstanding stuff, no doubt a largely unappreciated effort has gone into compiling and also maintaining this. Its absolutely a magnificent archive Wille Joe,The most complete and detailed u could wish to visit. Wow take a bow man,and thank you sincerely, ur archives have settled many an argument, and will continue to do so, ur a perfectionist and it shows in all of ur works,what are we going to do if u decide to call it a day.? ?Hope its not anytime soon, as exciting times ahead for Mayo. Well done WJ. A fantastic piece of Mayo history in one place. A great tribute to yourself and the many footballing stars we have enjoyed through the decades. A great debt of gratitude indeed. 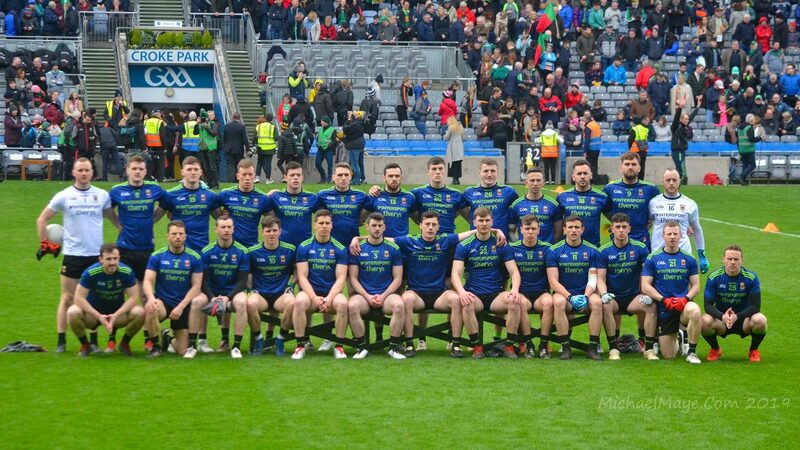 Does your diligent hard work know any end, Willie Joe?….A magnificent resorse, with great value to any student, fan of Mayo GAA.. This archive is a priceless asset and will solve many an argument. Thanks for all your hard work Willie Joe. Great work Willie Joe. You could probably knock a PhD out of it at this stage…….. Thanks, Willie Joe and well done. Your archive is what brought me to the blog in the first place. Enjoy the small respite that comes with the off season, if there is such a thing in Mayo football! Just checked out some results in ur brilliant results archive Wille Joe, 1978, never knew, New York minors played Mayo minors in Machale Park, in 78, and got hammered out the gate, Mayo 8-18 New York 1-3, didn’t know they had a minor team back then,what a question to puzzle someone with, if presented in the right way, u would get some mileage out of it,lol. @The mayo viking, do you reckon that is Swinfords Kevin Geraghty on the 76/77 U21s and the ’74 minors? He had quite an impressive scoring record across both grades. JP,it could well be, it would correspond with his age, He was a good Handball player as well. Swinford and Foxford was Ireland’s hotspot of Handball right up until the 70s. Fantastic sport. Bolingbroke drive in Swinford. Thanks for that Mayo viking, never knew the background to that. There was a Killaser farmer had some titles as well I believe, 60’s or 70’s. Foxfords alley had a queue to watch!! Wouldn’t be a hope of getting a game, people would be interested in local strong players facing off and Swinfords v Foxfords. Well done Willie Joe. We are blessed to have this blog and archive of results. More power to you and a sincere thank you for all your hard work so we can all (sometimes ) rant and rave about Mayo football and always being informed. Ur welcome JP, I remember it all so well, every ballalley was the same on Sunday afternoon, the local favourite, against the best in next town or village being the main event, a gang us used to jump in a car and head of to the Foxford alley,and mess around playing for a few hours,and then head off for a few beers around the town,great days, and memories, and nice people, O’Hara’s lounge was a favourite spot,it had one of the first pool tables,in the town I think, u would be waiting ages to get a game, with the usual shenanigans of someone jumping the queue, and they used have live music there as well, some top bands, and a variety of different performers, all tastes catered for, We were spoiled rotten,come to think of it, Our own X Factor right on our doorstep.